The Department of Electronic and Computer Engineering (ECE) at HKUST is an exciting place to study electronic and computer engineering. We are committed to undertaking world-class research and making exceptional students extraordinary. We have amassed a talented group of faculty members with PhDs from the world's top universities. They are internationally recognized as academic leaders, inventors, entrepreneurs, Editors of academic journals, and Fellows of peer societies such as the Institute of Electrical and Electronics Engineers (IEEE), and are eager to bring the latest technical knowledge and insights into the classroom. Our laboratories and classrooms are equipped with state-of-the-art facilities for cutting-edge research and multimedia teaching. We strive to prepare students to become outstanding engineers and leaders in the ever-changing world of high technology. Our programs cover a wide scope of modern technologies including Biomedical Electronics, Computer Engineering, Ecotronics, Embedded Systems, IC Design, Microelectronics, Photonics, Signal and Information, System and Automation, and Wireless Communications and Networking. These areas are critical to the growth of our information-based society and mastering these technologies should open up vast career opportunities. Students may enter our undergraduate programs through JUPAS Admissions or Direct Admissions. Besides academic development, our Department also provides students the opportunity to participate in enrichment activities such as internships, exchange programs, and student competitions for their personal growth. Applicants seeking admission based on their Hong Kong Diploma of Secondary Education (HKDSE) results should apply through the Joint University Programmes Admissions System (JUPAS). Starting in 2012, students with HKDSE attainments will be admitted to one of the 4 Schools (Engineering, Science, Business & Management and Humanities & Social Science). Prospective HKUST students only need to opt for the School they wish to join. In the first 2 to 3 semesters (1 to 1.5 years), they will take the compulsory University Core Curriculum Program and learn the fundamentals of the major programs of the School. The Schools will provide academic advice to help students explore their aptitude and interest before choosing their majors. Student has learned Chinese Language for 6 years or more in school, but has been taught an adapted and simpler Chinese Language curriculum not normally applicable to the majority of students in our local schools. Students admitted to the School of Engineering may choose to enter an interdisciplinary major upon completion of one year of study. In particular, students interested in Engineering and Business Management may wish to pursue a Dual Degree (BEng and BBA) in Technology and Management. Applicants who are applying for admission on the basis of qualifications such as Higher Diplomas, Associate Degrees, or previous periods of successful full-time study at local education institutions, should apply to the University through Direct Admissions. 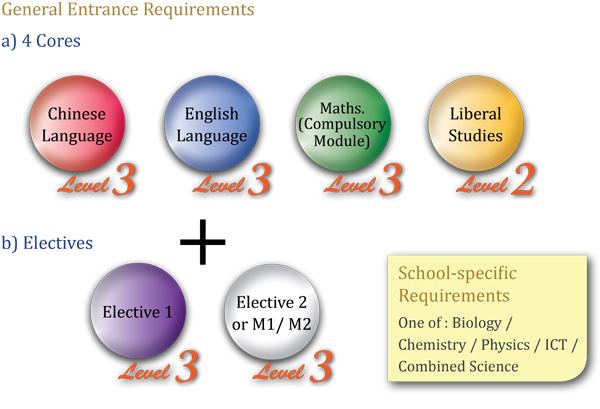 In addition, international high school students or non-local applicants with an International Baccalaureate diploma or GCE, for example, should also apply through Direct Admissions. A higher diploma or associate degree in engineering or a science discipline; or an equivalent qualification. Credit transfer may be granted upon admission for articulated higher diploma or associate programs. Successful applicants may also apply for credit transfer for particular courses once they have registered. Any credits awarded will contribute to the total required credits for the award of an honors degree.